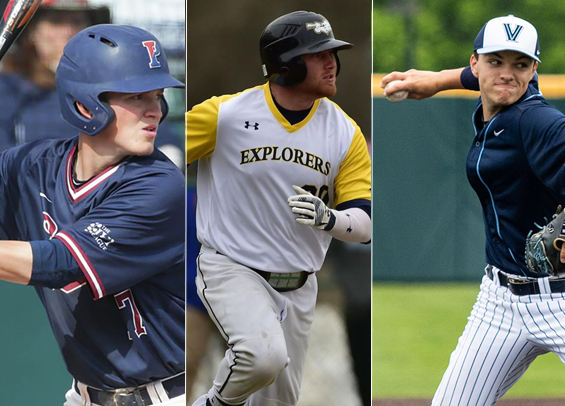 The Philadelphia Baseball Review released its Division-I College Player of the Week awards on Monday for the period ending March 17. Penn sophomore outfielder Eduardo Malinowski and La Salle senior third baseman Kevin McGowan were co-named the Philadelphia Baseball Review's Hitter of the Week, while Villanova sophomore right-hander Jimmy Kingsbury has been named the Philadelphia Baseball Review's Pitcher of the Week. Malinowski hit .550 for the week (11-for-20) with three triples, a pair of doubles, and 10 runs scored. He also drove in 11 runs for the Quakers who won five straight, including a pair of double header sweeps over the weekend against Fairleigh Dickinson. McGowan hit .556 (10-18) for the Explorers over the week, collecting five doubles to go along with six runs scored. He also drove in five. As for Kingsbury, he tossed a complete game one-hit shutout against La Salle on Sunday. He collected five strikeouts in the effort and retired 19 straight to finish the contest [story here].